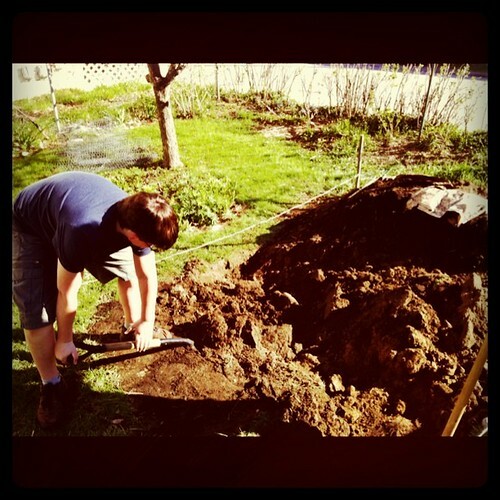 Today was about digging and moving earth. 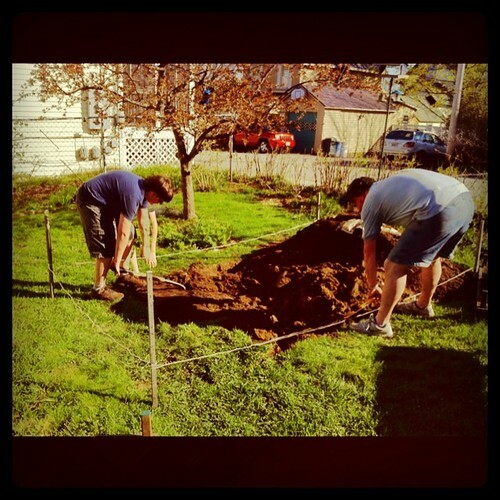 Three tons, or seventy seven cubic feet of soil, to be exact, most of it dug and moved by Alex and Adam. 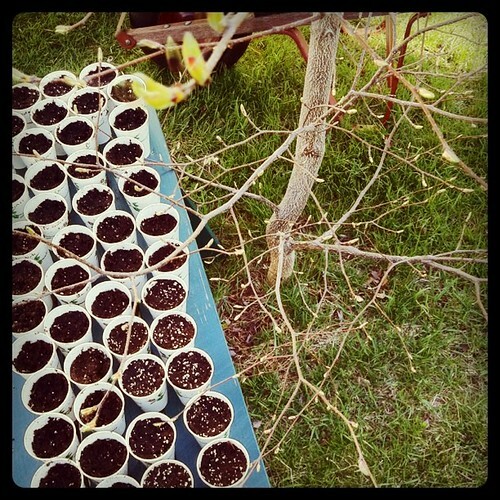 Once again we're changing and moving things around in the garden, trying out new ideas and experimenting. * We've decided that we want to have a larger vegetable garden and that meant dismantling some raised beds and configuring a new space. Oh, and digging. Adam and Alex used the double dig method which meant twice the work but means we now have a healthy bed in which to grow vegetables. So far we plan to grow bush beans, beets, carrots, broccoli, lettuce, cabbage, tat soi, onions, leeks, tomatoes and basil, some of which, like the beets and carrots, I'll sow this week. The bed will be expanded some on one end, making a boot shape, or something like it, soon. The goal is to capture as much sunny areas of our open space as possible. 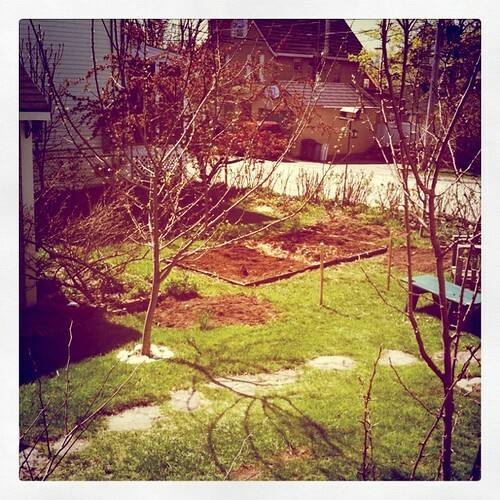 Where the old raised beds were, we'll plant with soil-improving clovers and wild flowers. For edging, Alex simply reused the old cedar boards from the dismantled raised beds. While all that digging was happening, I potted up some bush beans, cosmos, forget-me-nots and marigolds, to give them a little head start, in time for planting at the end of May. 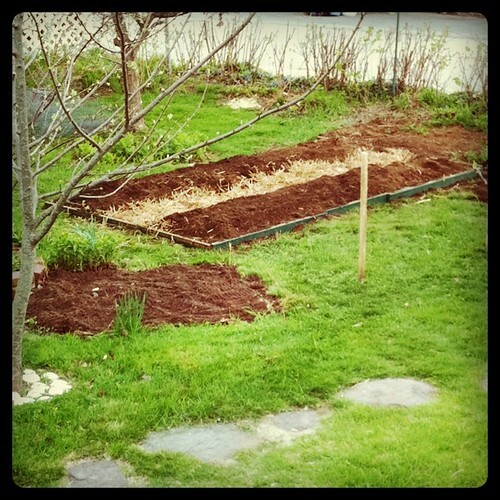 Oh, and Alex reworked the pea beds and got those planted as well. We're excited. It's been some years since we've done some serious veggie gardening. 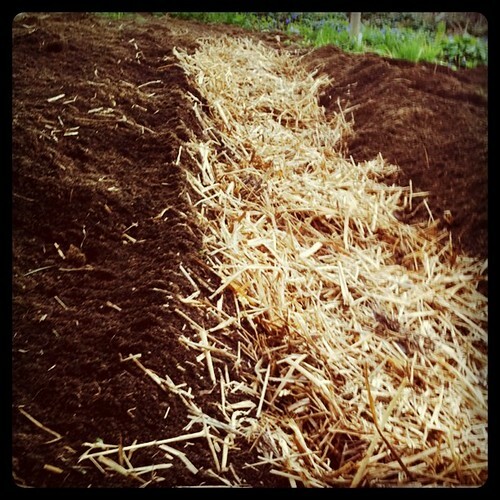 This time we're trying some different methods and plants and just looking at all that soil, all that dirt, well, we are inspired by the potential, which is basically the thrum of every gardener's heart. *It's Monday morning and I woke up certain I had messed up with the path placement in the bed, which Alex happily amended for me. Ah, that's better. Perfect! It is nice to have room to wiggle and adjust and follow the sun. Looks great! Those garden beds look just about perfect, you are going to enjoy a lovely garden, I am sure of it!